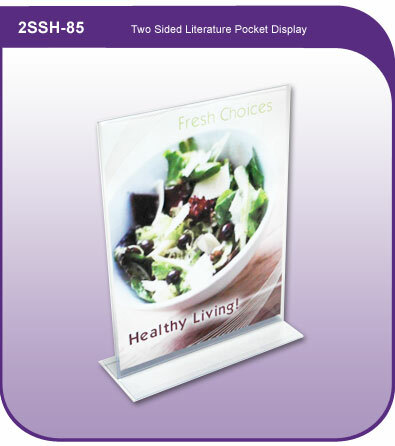 The 2-Sided Literature Pocket - 8-1/2"w x 11"h is perfect for counter top or tabletop display usage! The Model #2SSH-85 is a 2-sided literature pocket made from durable Die-Cut Clear 30 mil. Vinyl that accepts your literature or signage from its unique bottom fed opening. The 2-Sided Literature Pocket can accept printed materials up to 1/16" thick.